So far we’ve been discussing how the tech industry has long excelled at optimizing how software gets developed, but tools and frameworks for deciding what products and features to build have been slower to emerge. That’s a problem, because optimizing the how can help us iterate faster, but only by shipping production-ready software. There must be a better way to discover what users really need without slowing down the efficient systems we’ve developed for delivering software! The answer is dual track agile. With just the top priority ideas on their plate, developers can deliver valuable features faster. That means feedback can be collected sooner, helping the product team further fine-tune what gets built. In either event, they’re likely to get key details wrong, which threatens to waste the team’s time and degrade the quality of the product. Building software, even efficiently, is an awfully expensive, frustrating, and suboptimal way of discovering what users really need. Expensive because software is time-consuming to code and maintain. Isn’t there a faster, cheaper way to learn? Frustrating because developers don’t enjoy committing to build potentially infeasible features with fuzzy requirements in tight timeframes, particularly when it might all be for naught. Suboptimal because blindly iterating on an arbitrary feature idea until it’s deemed valuable means not spending that time delivering another feature that is best aligned with the needs of your target market and overarching product strategy. In short, why risk investing in building the wrong feature if you can first validate your understanding of the existing need and the ideal solution? 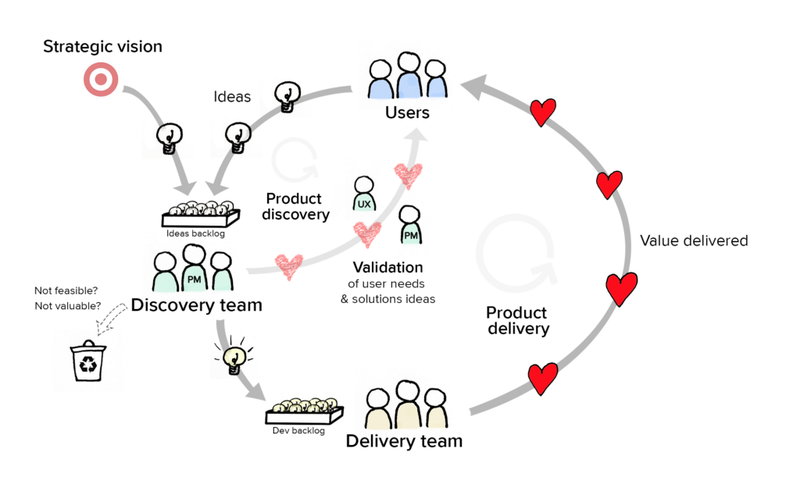 The discovery cycle is the process of actively capturing, researching, and prioritizing user needs — as well as collecting and validating solution ideas for addressing them. It complements the delivery cycle, which efficiently transforms validated product ideas into valuable product functionality. At productboard, our product discovery process begins while communicating with prospects and customers on Intercom, over the phone, or in person during office visits and meet-ups. Customers routinely make requests or mention painpoints they have with our product today and our job is to dig deeper to understand what they really need–what they are really trying to do. If feedback is positive, the prototype itself can serve as a feature spec when the feature is sent along to the delivery team, saving additional effort down the road. For more on problem & solution interviews, we recommend Ash Maurya’s Running Lean. 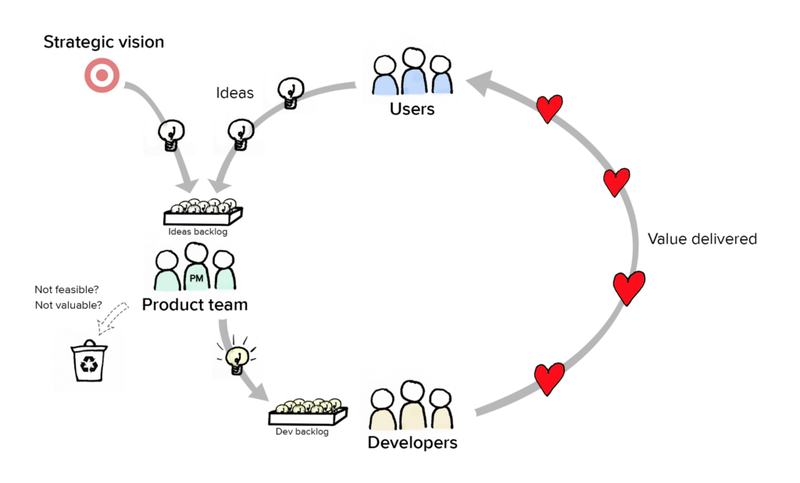 Still, collaboration between the discovery and delivery teams is more than simply passing off requirements and deliverables from one team to the next — “mini-waterfalls within Scrum”, as Marty Cagan calls it. For example, with limited time and resources, the discovery team might call on a technical lead to help rule out feature ideas that would be infeasible to build. Together, the discovery and delivery teams form a super team, responsible for bringing value to the customers. The super team only works when members from both teams collaborate to discover, validate, and deliver solution ideas. For a more detailed overview of dual track agile, particularly within the context of Scrum, see Kevin Albrecht’s superb article, which inspired many of the ideas in this post. What tools can teams use to manage it all? We’ll cover that in part III! Coming soon.